Simple online listings for property managers. Developed during the course of a real world property management project our system delivers simple, effective, online property management. The system has a simple control panel, accessible from any computer with an internet connection. Simply enter the property details and our clever system does the rest including printable property details for your shop window and a printable summary list for your customers. No formatting necessary and no duplicate data entry. We offer a number of clever features for you and your users. Users can keep up to date with new property added without having to fill out complex forms. 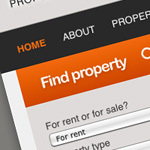 It features a simple search to find property which can be customised to meet your business needs. Custom designs can be produced to fit in with your own 'look and feel'. and importantly in such a competitive market - it’s search engine friendly! Find out about a real world example.